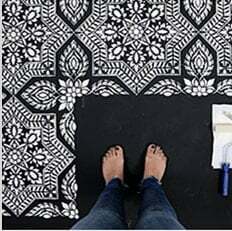 EXTRA LARGE: Sheet size: 20.9"x47.8"
This ornate feather stencil is so easy to use, virtually anyone can do it. Simply tape it to the wall using BLUE painter's tape, then load your foam roller with the paint of your choice (latex or acrylic). Get rid of excess paint by rolling the foam roller over a folded paper towel. Then, just roll it over the stencil applying medium pressure for an instant fabulous result! Don't press on the roller too hard otherwise you might get some bleed. Transform your room in less than 1 hour! All of our stencils are made of thick, sturdy but flexible 12 mil clear plastic, reusable, easy to clean and stenciler-friendly! In our 20+ years of professional stenciling this material has proven to be far superior than any other material we used, including the industry standard 8 mil mylar. We are certain you'll notice the difference and will love working with it, just like all the folks who already bought our stencils.